In my study of Stockholm maps and in my study of Stockholm’s tollhouses and toll boundaries, I found that the city didn’t grow much throughout the entire 18th century. This is also reflected in the fact that only two churches were added to the city during the 1700’s. 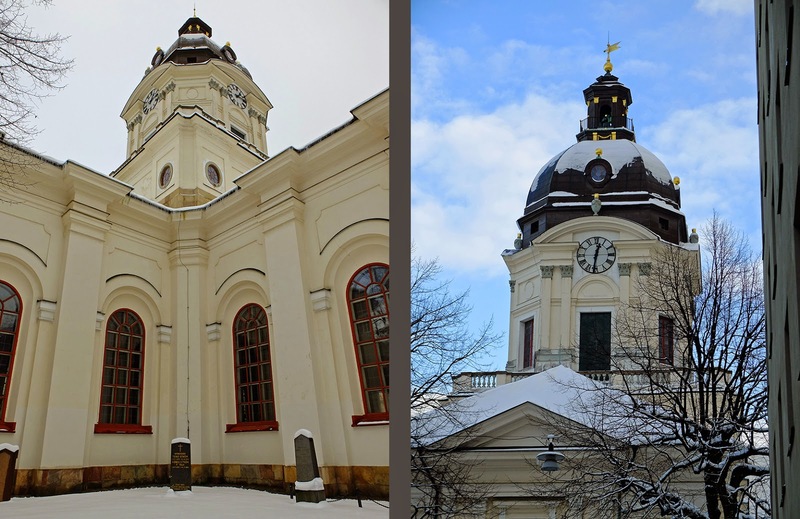 Adolf Fredriks Kyrka was the only significant addition to Stockholm’s churches throughout the entire 18th century. The church was literally built around a smaller wooden chapel that had been on the site since the mid 1600’s. St. Olaf’s Chapel was part of the Klara parish (see #1, Churches of the 1600's), but by the mid 1700’s, the parish had grown enough to split into two separate and self-supporting entities. The existing wooden chapel was deemed too small and too modest to be the seat of the new Adolf Fredrik parish; a call for design proposals for a new church attracted several entries. The winning entry by City Architect Adelcrantz was the only one to adhere to the competition’s requirement that the existing chapel could be in use until the day that the new church opened its doors. Adelcrantz's drawings for the new church. Note that the original plan was a Greek cross like St. Olaf's Chapel. Adelcrantz’s proposal was to build the new stone church around the existing chapel. The new church thus inherited the original chapel’s location, its orientation, and its Greek cross floorplan. 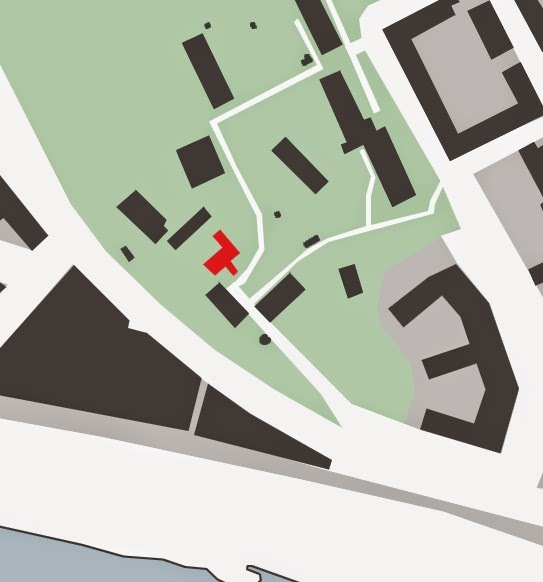 The wooden chapel was located in the middle of a block (although not precisely in the center), and a map from 1663 shows that one street to the south of the church dead-ended into the church block. By 1702, the northern block was also split by a new street which dead-ended at the church. 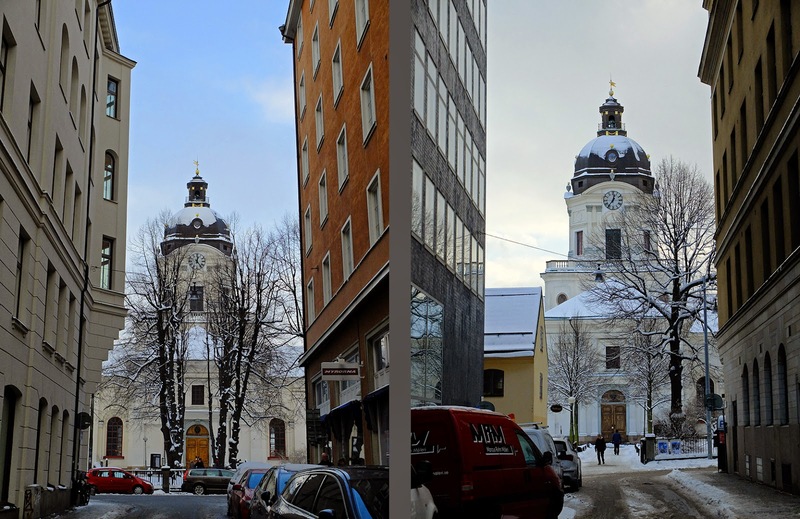 The church seen from the south (Olafsgatan) and from the north (Saltmätargatan). Part of Adelcrantz’s proposal was to divide the block to the west of the church with an extra-wide street. This created a view from Drottninggatan, one of Stockholm’s busiest thoroughfares at the time, to the church’s front door. View to the church down Wallingatan from Drottninggatan. These direct views from the south, north, and west were possible because the church, like all of Stockholm’s churches built after Örnehufvud’s city plan, is oriented according to the street grid and not strictly on an east-west axis (see my post Churches of the 1600's). 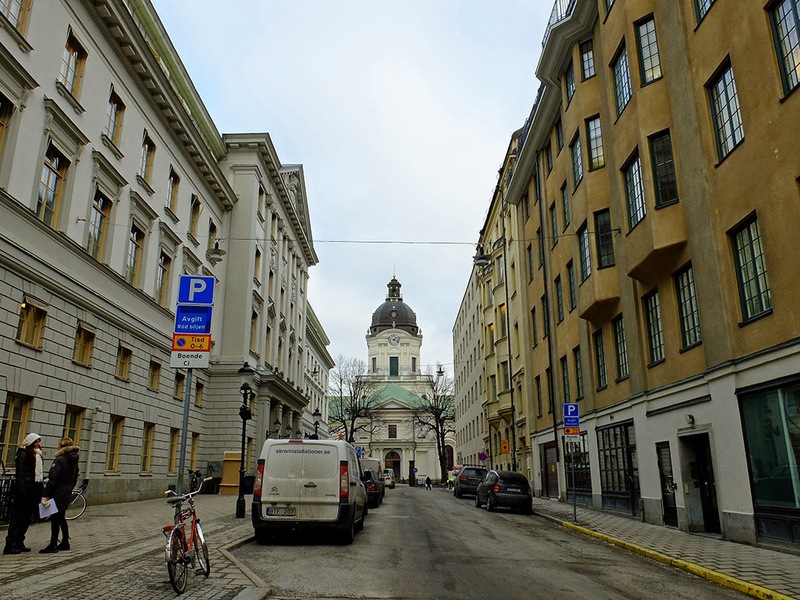 It wasn’t until 100 years after the church was built that Sveavägen, the street to the east of the church, was widened to become such a major thoroughfare. 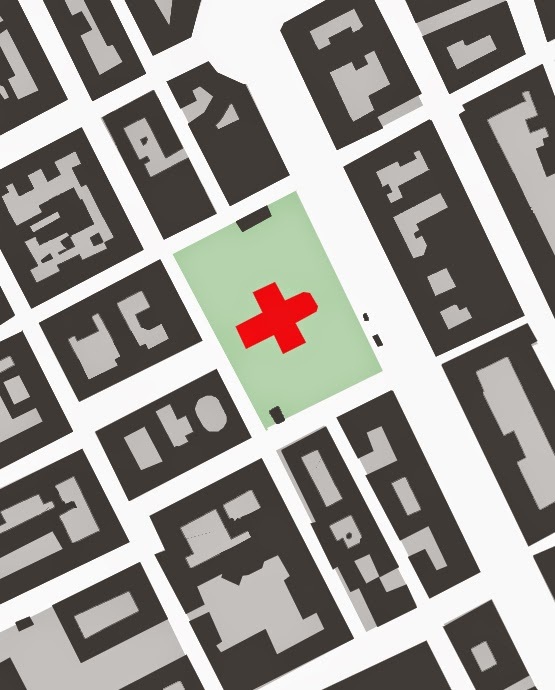 Today, the church’s site is experienced in passing, but historically, the church’s site would have been experienced more as a destination and as a focal point in the city’s fabric. Although Adelcrantz inherited the Greek-cross floor plan of the existing chapel, he elongated the east-west axis to create an axial plan. Was Sweden moving away from the more inward, human-focused central plan toward a more traditional liturgy with processionals? It is impossible to confirm with a sample size of only one church, but it does seem possible and in keeping with Stockholm’s other central churches which moved the alter from the center of the church to the end of a wing, creating an axis within a symmetrical space. In style, Adolf Fredriks kyrka is a Swedish interpretation of French Rococo. While French Rococo was exuberant and decorative in the extreme, the Swedish interpretation is quite staid and modest with few exterior details and a simple, white, bright interior. Exterior details include pilasters which interrupt the roofline, window niches, and a relatively detail-rich central tower. The interior is slightly more exuberant with plaster details and pilasters which “arc” across the ceiling. 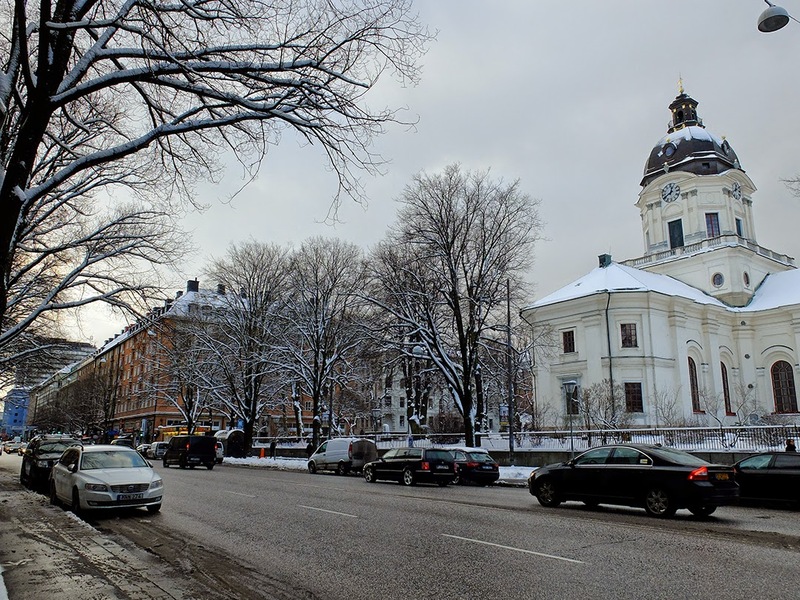 While Adolf Fredriks kyrka is situated amidst the tight urban fabric, Sabbatsberg Kyrka was in a rural setting, and that rural setting is still apparent today despite the fact that the Sabbatsberg area is now part of central Stockholm. Sabbatsberg Kyrka was not built as a church. Instead, it was originally the main house of Sabbatsberg Malmgård (suburban farm), built in 1717. Being on the main road between central Stockholm and Karlberg Palace, a subsequent owner used the building as a pub and inn. The adjacent mineral spring had been a health spa of varying popularity since the 1680’s, and in 1751, the Stockholm Parish bought both the spa and the entire farm. While the spa was seen as a money-making venture for the parish, the farm became a parish-sponsored poor house and hospital. Being a religious institution, it was only natural that a church was needed on the premises; the inn was converted to a church in 1761 by master mason Georg Förman. The adjacent farm building was renovated to be the church’s sacristy. The church is the yellow building, and the sacristy is the red building. As the building was not originally intended as a church, its layout and orientation are not at all traditional. The main entry is from the south, and one enters at the middle of the space instead of at the back as is usual. Both the church and the sacristy are of log-cabin timber construction, but the church's timbers are protected by outer paneling. The sacristy's timber structure remains visible. 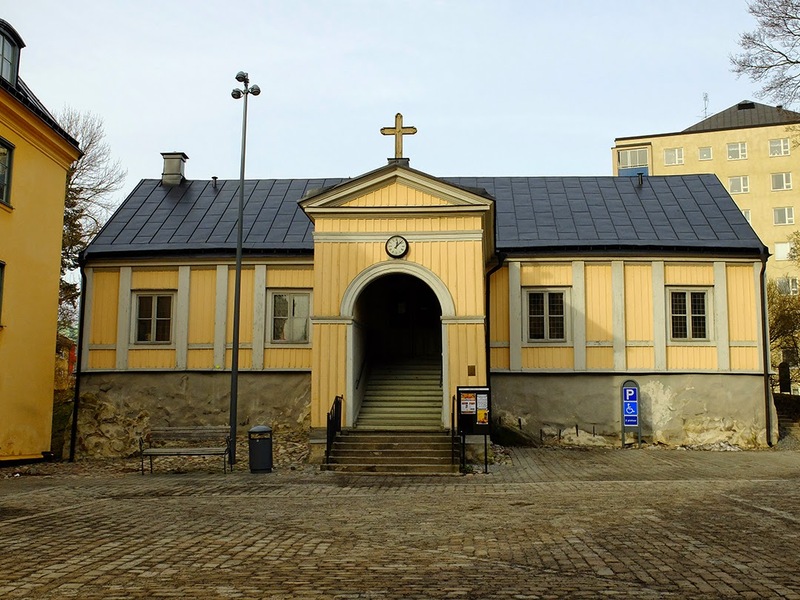 Sabbatsberg has always been on the periphery of Stockholm, and even today, when central Stockholm has enveloped the area on all sides, Sabbatsberg remains rural in character and the church is infrequently used. Unlike Adolf Fredrick, a larger, more grandiose church was never needed.